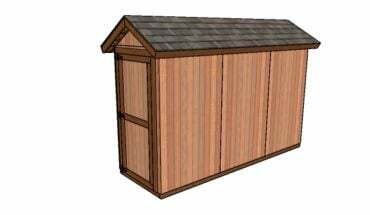 This step by step diy woodworking project is about 8×16 gambrel shed plans. I have designed this narrow barn shed so you can store your garden tools and other items with style. This shed is sturdy and it features a 4′ wide door for easy access. Remember that you need to read the local building codes before starting the construction, so you comply with the legal requirements. See my other shed plans HERE. The first step of the project is to build the frame for the 8×14 storage shed. As you can easily notice in the diagram, you need to cut the components at the right dimensions. Use a saw to cut the components from 2×6 lumber. Align the edges with attention and make sure the corners are square. Drill pilot holes through the rim joists and insert 3 1/2″ screws into the perpendicular components. Fit the 4×4 skids under the floor frame. Align the skids with attention and use screws to lock the frame to the skids. The skids will lift the frame from the ground and therefore, they will protect it from moisture. Fit 3/4″ plywood sheets to the floor frame. Align the edges flush and insert 1 5/8″ screws, every 8″ along the frame. Leave no gaps between the components. Building the side wall frames is a straight forward process, as you need to cut all the components at the right dimensions and then lock them together tightly with 3 1/2″ screws or framing nails. Place the studs every 16″ on center and check if the corners are square. Place double studs at both ends of the components for a professional result. Next, you need to build the front wall frames. Cut all the components from 2×4 lumber, as shown in the diagram. Drill pilot holes through the plates and insert 3 1/2″ screws into the studs. Place the studs equally spaced. You can adjust the size of the door opening to suit your needs. Next, build the back wall for the backyard storage shed. Cut the components at the dimensions shown in the diagram and then use the same techniques described above to assemble the wall together tightly. Fit the wall frames to the floor of the shed. Align the edges with attention and plumb the wall frames with a spirit level. Drill pilot holes through the bottom plates and insert 3 1/2″ screws. In addition, you need to lock the adjacent wall together tightly with 2 1/2″ screws. Make sure the corners are square and align the edges with attention. This gambrel shed is compact and it features a large front door. If you want to see other shed designs, take a look over my other projects HERE. This is a small storage shed, making it ideal for a small backyard. Don’t forget to take a look over PART 2 and PART 3 of the project so you learn how to build the roof and the front door for the storage shed. If you like my project, don’t forget to SHARE it on Facebook and Pinterest. Thank you for reading our project about 8×16 barn shed plans and I recommend you to check out the rest of the projects. Don’t forget to LIKE and SHARE our projects with your friends, by using the social media widgets. SUBSCRIBE to be the first that gets our latest projects.